Parathas make a filling, healthy breakfast, snacks or dinner recipe. In this recipe, the mildly spicy and flavorful carrot filling is stuffed inside paratha and roasted until golden. This easy & delicious parathas also makes a nutritious lunch box recipe for kids. 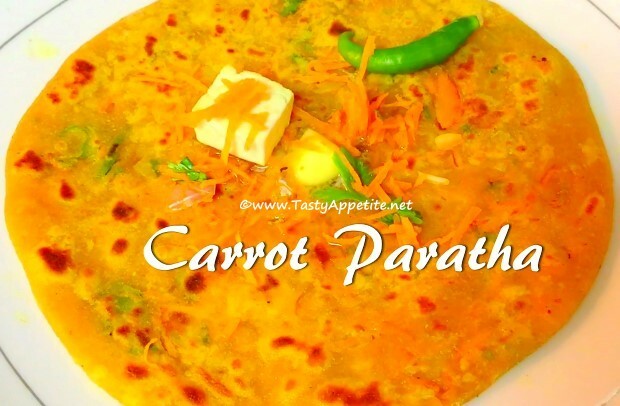 No doubt kids love this beautiful orange colour and appealing carrot flavor of the paratha. Prepare this yummy gajar ka paratha at your home too with this easy video recipe! To start with, add 1 cup of warm water to mixing bowl. Add turmeric pwd, red chilli pwd, cumin pwd, salt and mix well. Add a tbsp of ghee or oil to make smooth dough. Cover it with damp cloth and set aside. Lets prepare spicy carrot stuffing. In second bowl, add grated carrot, sliced onions, coriander leaves, green chilli, salt, turmeric pwd, cumin pwd, ginger garlic paste and mix. Mix well. Stuffing is ready! Make small balls out of dough as shown in video. Take a ball, pat it flat and dust with wheat four. Now roll the ball to thick round shape. Repeat the same for all balls. Drizzle oil or butter and heat. Place the rolled paratha and fry on both sides. Once the paratha is cooked golden all over, remove from flame. Flavorful delicious carrot paratha is ready. Serve hot with yoghurt, pickle or any curry of your choice.